This piece was originally published on Bill Scheft's Tumblr. It is Sunday, around 1:30 pm, as I write this. If you must know, my boss of 24 years, Dave Letterman, is where he always is on this day, somewhere on Pit Row at the Indianapolis Motor Speedway. His driver, Graham Rahal, is currently running ninth with 132 laps to go. Maybe by the time I finish this, he’ll be farther up on the others. And so will you people…. If you must know, I feel relieved and extremely proud. But that’s all I can give you right now. Mercifully, for the purposes of this exercise, how I feel is not important. You saw it, you know how it made you feel. That’s all that is relevant, practical and real. But I can take you through the last day and maybe there will be something there. Something else. Something else, like that last 78 minutes we all had together. THE MORNING: I am not a superstitious man, but I do love subtle symbolic gestures. So, I decided to wear the same gray glen plaid suit I had worn to the last show at NBC 22 years ago. I didn’t think of it until Chris Albers posted that photo of me on Twitter at my desk. I knew I still had the suit, and I hoped it still fit. In the spirit of rigorous honesty, I could have worn it as is, all zipped up and buttoned, but I might have passed out somewhere during the Taco Bell remote. So, I had my dry cleaners take out the pants an inch. I got a lot of compliments, and when I would tell people the significance of the suit, they would look skeptically until I produced a photo or two from my pocket. THE WORK DAY: The final show had been lovingly built brick by brick by Barbara Gaines over the last six months. Her title was executive producer. Her everlasting credit will be my best friend. By the time we all turned up for work Wednesday, there was almost nothing to do. Almost. The four tape pieces (Kids, Taco Bell, Day in the Life and the final montage) had gone through their last incarnations and had been signed off on by Dave. The guests for the Top Ten had been booked. We knew there may be some final changes to the list, but that wouldn’t happen until rehearsal, which was five hours away….which is like a generation on a strip (nightly) show. So, for most of the morning, everyone was kinda antsy. Antsy like Alan Shepard in the cockpit of Freedom 7 (”Let’s light this candle!”). We just wanted the show to start. The monologue, my main responsibility (along with Steve Young), had been put together the night before. 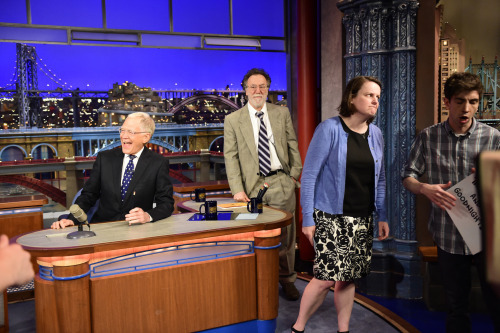 We never do it this far in advance, but because there were no jokes based on topical material and Dave wanted no distractions on the final day, we compiled it just after the Tuesday night taping and just before a 7 p.m. technical rehearsal. We settled on 11 straight jokes and five enhancements (one live element – the giant print on the cue card, and four short tape pieces) for 16 total jokes, which is the number we usually shoot for. We knew if we got anything on Wednesday that we really liked, we could slot it and replace what we had. We monkeyed with the order a bit, but the "Tonight Show" joke (written by Mulholland and Barrie, aka “The Boys” even though they’re Dave’s age) was always going to be first out of the shoot. In 24 years, I remember a handful of times when the opening remarks had been set a few hours before the taping (anniversary shows, the first show at CBS, the first show after his heart surgery), but never the day before. For those of you who really want the complete monologue deconstruction, we started with 22 jokes under consideration (on cue cards) and we quickly got down to 12, then 10. The last two jokes cut were a mini-run, I now enter a new phase of life: Moping…. I now enter a new phase of life: Shouting out answers while I watch game shows….They were cut because he had done a joke that day, I now enter a new phase of life: Googling “foods that help your prostate…” which he felt was the best version of that premise and it didn’t make sense to revisit. So, we had 10. We were one short. I pitched a joke to him written by Steve Young that he had passed on: My son is not clear on what’s going on. He keeps asking, “Why does Daddy have to go to prison?” He remembered it and laughed and realized we had nothing in the monologue on his family. So, it went in. Over the years, I have pitched a lot of jokes in the 11th hour and I would say he’ll take one for every 20 I offer up. It was especially gratifying because it was a Steve Young joke, and it didn’t sound like anything before or after. The final breakdown of jokes was also pleasing in its numerology: three for The Boys, three from Chris Belair, two from me, two from Steve Young, and one from Chris Albers, who wrote jokes at the old show when he was Paul’s assistant before moving on to an 18-year career running Conan’s.monologue. Chris was one of a half-dozen former writers I invited to contribute to the final opening remarks: Gerard Mulligan, Adam Resnick, Larry Jacobson, Frank Sebastiano and Jeff Stilson. They were all touched and grateful to have the chance, and I loved that one of them scored. Even though we had a monologue, the main opening remarks writers (me, The Boys and Belair) pretended it was just another day and turned in our submissions at the regular time, along with the freelance guys. Dave considered a couple, but nothing made it through. My last effort looked no different in format than my first, which I typed on an IBM Wheelwriter and turned in Monday, Oct. 21, 1991, except that just under Opening Remarks Scheft 5/20, I wrote the last line of Catullus poem No. 101 (Atque in perpetuum, frater, ave atque vale.). In the makeup room, he asked me to translate the Latin, and I managed to not choke up when I said, “And into eternity, brother, hail and farewell….”). Truth be told, there was one joke of mine I would have loved him to slot in under the wire: 35 years ago, I stopped drinking. I think that’s long enough, don’t you? The three of us (Dave, me and Todd Seda) ran through the cards three times, just as always. We ended up replacing one of the taped elements (”Me in Two Weeks”) with a Steve Young piece called “Comedy We Would Have Done Tomorrow,” a beautiful last deep wink and nod to the notion that we were cluelessly continuing as if the show was not ending. We kept the hologram of Dave saying goodbye to the staff and the cultural impact moments from “The Simpsons” and “Wheel of Fortune.” For once and at last, everything was in the right order. Rehearsal, which I only attend if I’m in a sketch, was noteworthy for two moments, neither of which I witnessed. After the Foo Fighters had run through “Everlong” live for the first time to accompany Barbara Gaines’ epic montage, she leaped onto the stage and hugged Dave Grohl. Six months she had worked on this, her singular swan song after 35 Dave years, with Randi Grossack, Mark Spada and a battalion of self-doubt. Can you blame her for lunging? Our final day together in the dressing room preparing for the taping was remarkably similar to all that preceded it. Dave, Me, Nancy, Barbara, Jude and Matt laughing about something from another show, another year. Jane with the makeup. The only difference was Les Moonves stopping by to say hello, and at 4:26, many people yelling, “Biff is coming!!! !” for the last time instead of just wardrobe person Natalie Fowles. Dave walked slowly down the stairs to the stage door, as he always does. You want to know if I got emotional? Just once. In the middle of the Final Montage, in the middle of that masterpiece, I looked over at the podium just as Nancy Agostini grabbed Barbara Gaines and threw her behind the podium so she could observe what she had so lovingly wrought on the podium monitor. That elegant, beyond affectionate gesture was not lost on me. Three years ago, Gaines had chosen Nancy to replace her after nine years running the show from the floor. In the 33 years between NBC and CBS, Barbara Gaines had been behind the podium longer than anyone. Barry Sand, Robert Morton, Rob Burnett, Jude Brennan and Maria Pope had toiled before her. Then Nancy, the very first writers intern at NBC who I have know since she was 20 and living in an all-women’s hotel, and who, like I have to tell you, is not from this Earth. For Barbara, giving up the tiller was not easy, but necessary and an act of supreme humility. And now, she got one last moment at the podium. The last moments of the last show. That got me. Good Christ, that got me. My time is up. You’ve been great. Enjoy The Truants….